Regular bunnies will quiver and quake with the arrival of the Super Bunnies! These new bunnies give players die roll advantages, tow card plays, and bunny color monopolies The Stainless Steel Deck adds 55 cards to your existing set, higher Level Defense Cards, and just a tad more Cabbage and Water. Other fantastic cards include: Dated Weapons with a level that depends on the day of the month. Miracle Growth to double your clovers, Duck Tape which allows you to launch multiple weapons at an opponent, and Happy Scrappy Hero Pup who might just save the day. 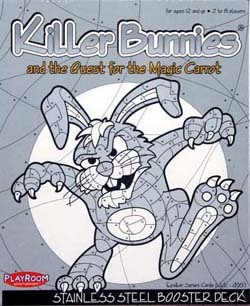 Can your bunnies survive the Japanese Rabbit Trap or an attack from Pumpkin Ridge? Use Temporal Flux to escape a treacherous opponent or 1943 to "steel" his cards. This Booster Deck has zeal, it's quite ideal, and it's name is Stainless Steel.